Join the discussion on our forums! Come discuss Savage Striker over in our dedicated Savage Striker discussion topic. Battlecry: Deal damage to an enemy minion equal to your hero's Attack.
'' Ruthless at tribal roasts." since it's not Odd i doubt it will have any use. On turn 2, it's a 2/3. Nothing special but nothing hopelessly terrible. On turn 4 with your hero power, it's a 2/3 that deals 2 damage split as you please across enemy minions. Ties with Fire Plume Phoenix; the ability to split damage just about balances out the lower attack. When top-decked, it's a 2/3 that (probably) deals 1 damage to a minion. Not great value, but few 2 drops are. Conclusion: Quite solid in arena. 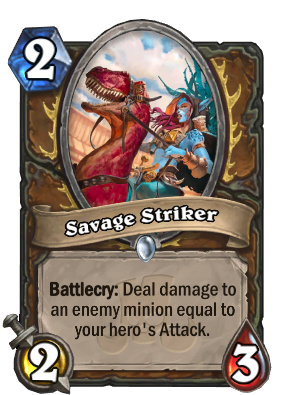 Hard to justify in constructed, until/unless we see good "give your hero attack" cards revealed. Decent body. Possibly synergy with Claw, Gnash, Savage Roar, Bite, Twig of the World Tree, and Malfurion the Pestilent, none of which are that great... Needs more support. Could be okey with DK Druid hero, but probably you didn't need this either. Potentially a good sleeper card but nothing special on turn 2. Savagery on legs. I played this card only once since classic - in Malygos armor/hero dmg deck. It was pretty viable back in 2015 and it would be really fun to play like this shapeshifter once again.